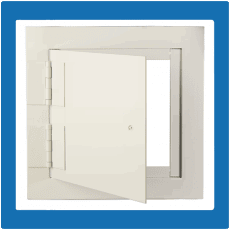 There are times when it’s not enough to just have easy access to pipes and wiring behind the wall or ceiling. Often, certain utilities are sensitive, and adjustments need to be made only by authorized personnel or professionals. This is particularly true for commercial buildings or homes set up with smart technologies in their electrical and plumbing systems. Karp security access doors and panels answer that need for safe and protected utility access that sets minds at ease. 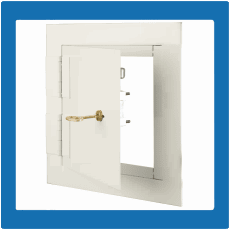 Available in medium and high security variants, Karp’s access door and panel solutions ensure that only those authorized to change the building or home internals are granted that properly. Medium security doors use a flush, tamperproof spanner head lock and latch, perfect for housing projects, hospitals, or any instance where a more secure access door is needed. High security doors, on the other hand, use a heavy-duty detention type lock and latch, perfect for architects and institutions to place maximum security at areas where access is required for repair or maintenance purposes. A prime coat of rust inhibitive electrostatic powder is used as finish on the door’s and panel’s baked white enamel steel door and frame.